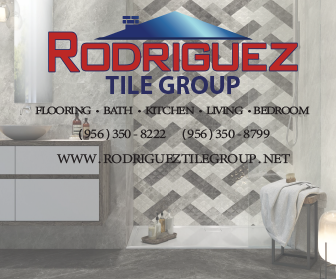 Gonzalez Tile of Brownsville executes a flawless triple play with Wood, Granite, Quartz. Game over! Mixing it up in the kitchen is nothing new to most of us, but how about mixing up your kitchen counters. Mixing and matching kitchen cabinet doors is a big trend, and now we’re seeing a marrying of materials in countertops too. 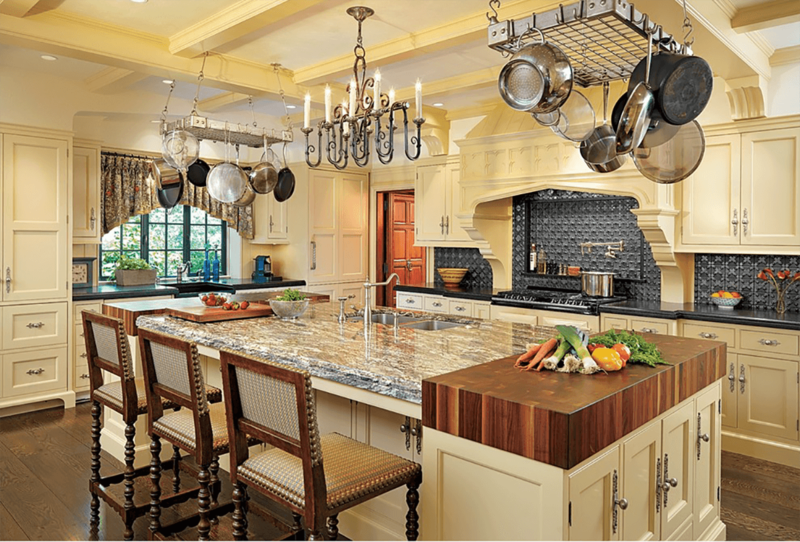 Combining different styles of countertops in contrasting colors and textures has several benefits. 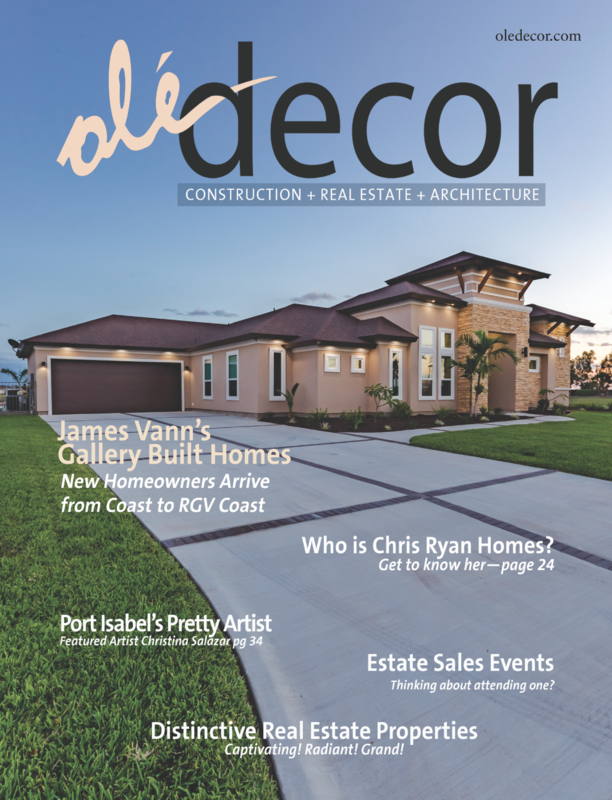 It creates visual drama, offers versatility and can help stretch a budget. If you’ve had your eye on an expensive slab of marble or stunning hardwood, for example, you’ll be able to use it in a small area as a focal point while installing something more affordable in the rest of the room. Surfaces can be tailored to functions, such as a heat-resistant top for the cooking zone and a warm wood for the eating area. So whatever your style or taste, there’s room for more than one countertop material in your kitchen. Magma Gold granite and butcher block island Flat Polish finish. One word Harmony! 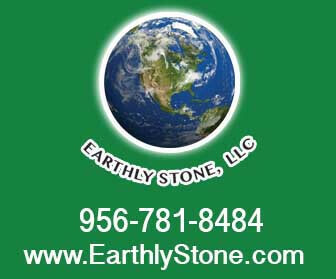 Earthly Stone. Wood combos. Wood is the stalwart of the kitchen surface, but if you want something a bit different, try pairing it with a contemporary composite or natural stone. 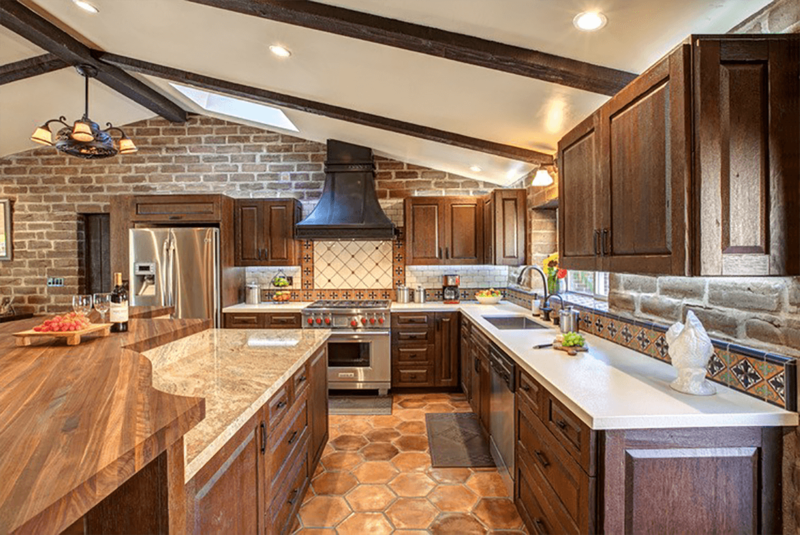 Many people pick wood for its good looks, but it needs regular oiling when used around the stove and sink to prevent scorching and water damage. Therefore, if you desire the beauty of wood but want to be practical too, use wood just in the eating area to save a heap of time on maintenance. I love the combination of distinctive wood grains, such as zebrawood or iroko, with modern pale surfaces, such as limestone. Paired up. Kitchens that feature countertops in the same finish as the cabinets have a smart, uniform look. It’s a good practice to follow when combining materials to avoid having space look overcrowded. 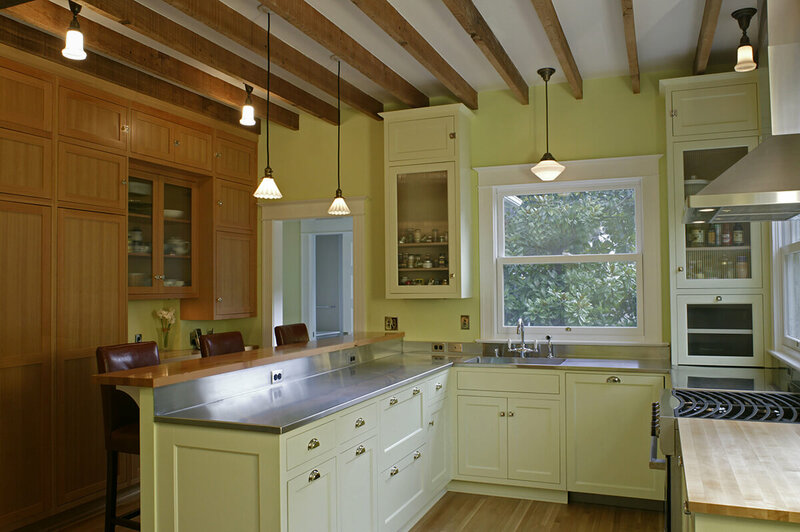 If you are mixing a wood with a colored surface and cabinets, consider the tone of the wood. 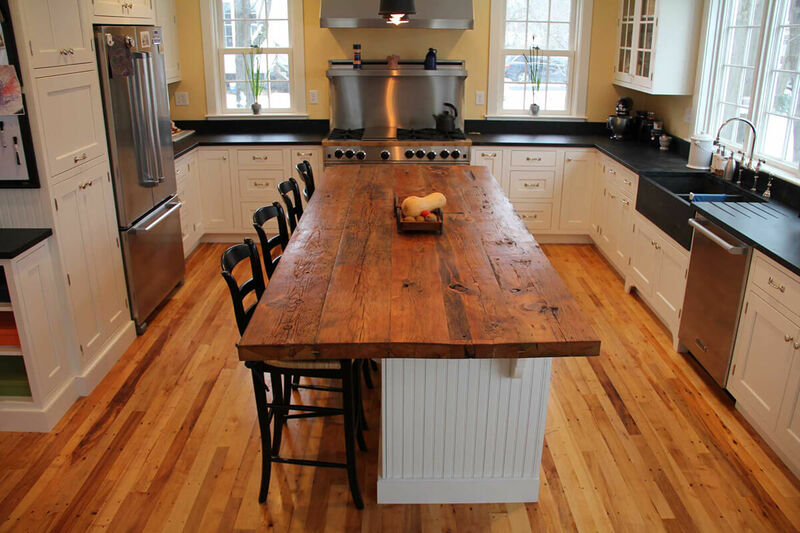 Color varies within wood countertops, and the result can feel either warm or cool. Pairing wood with the right color is crucial. Combos that work well are pale oak with deep gray and rich walnut with cool green. Who said glass was fragile. 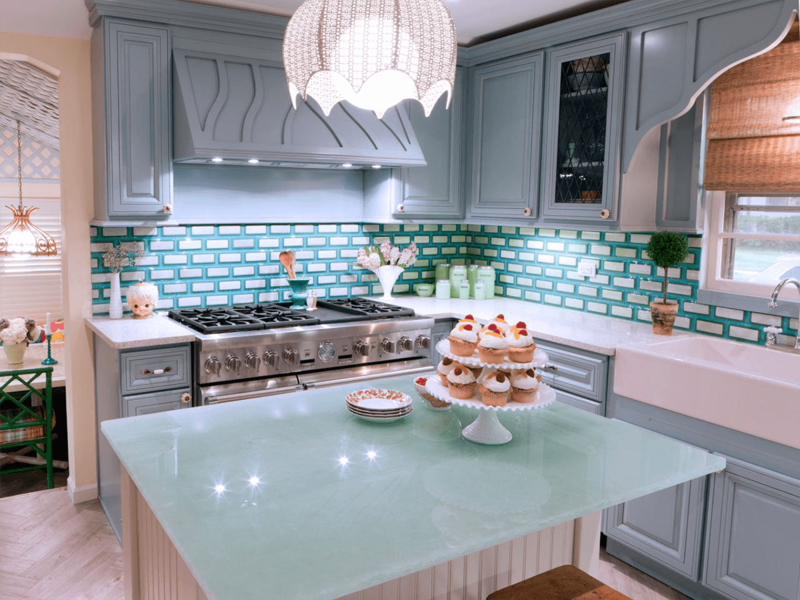 This one-inch green tempered glass countertop on this kitchen island looks and cool as iceberg ice and takes a pounding from the hardiest of meat tenderizers. Get your slab from the folks at Glass Mart. Practical finish. Bakers know the benefits of rolling dough on a chilled surface (it doesn’t stick so much). Why not include a glass section or a marble slab of at the end of a wood or laminate counter to handle the job? It also creates an interesting visual feature. Raw edge. 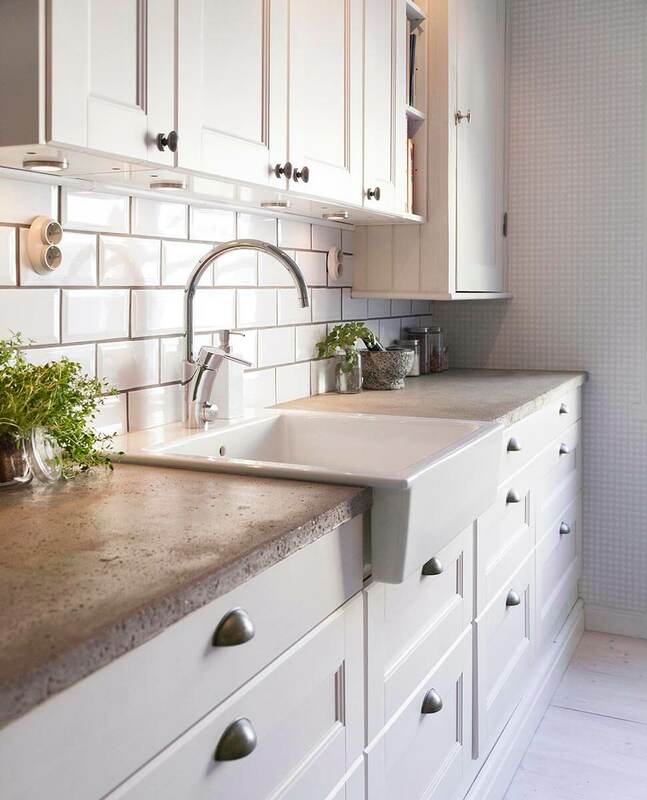 Polished concrete countertops make a statement and can be perfect for channeling an industrial look. However, their texture and finish can feel a little cold and uninviting for an eating area. 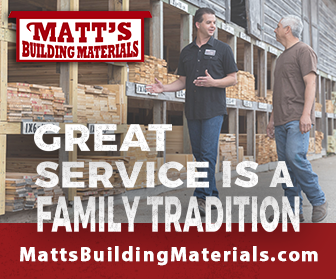 Try pairing yours with a smooth and clean-looking surface, such as a composite material. Composites are man-made materials that use rock minerals suspended in tough resin. They are stain resistant, easy-care and antibacterial. Color blocks. 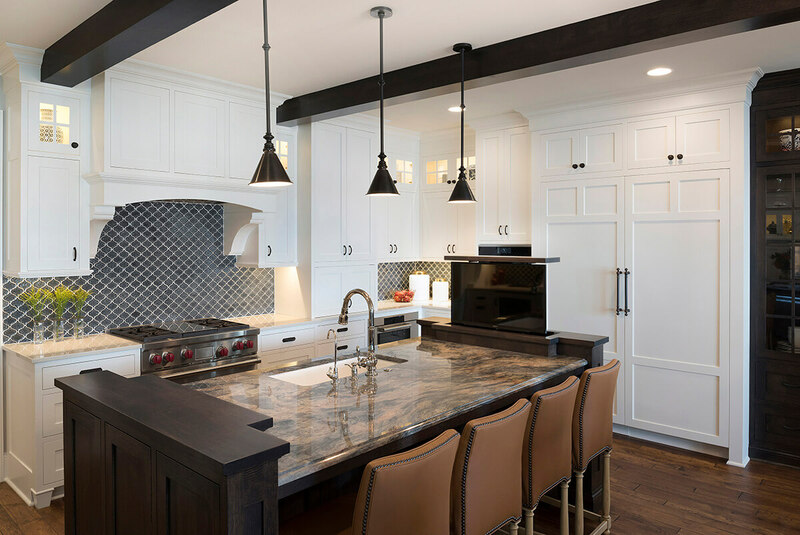 The steely shine of stainless steel, the deep veins of marble, mix in an end section of the perfect granite slab topped with warm wood tones for your butcher block island. Don’t be afraid to use multiple materials throughout your kitchen surfaces where each one will naturally create its own station. The professional touch. 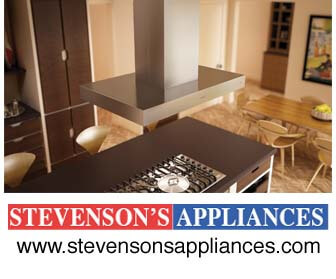 Stainless steel countertops are hygienic and can withstand heat, water, and stains. However, steel is pretty chilly to touch, and it does scratch, so it’s probably not the ideal material for a breakfast bar, which sees a lot of cutlery action. 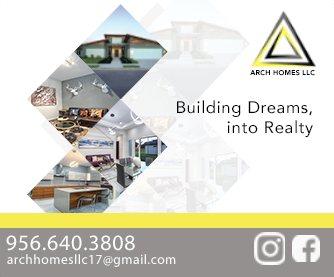 Pairing it with another smooth and sleek surface for the eating area, such as limestone, will make your serious kitchen welcoming yet very functional. In this kitchen, Astro Marble masterfully demonstrates the delicate dance between Cultured Marble and Quartz. Attractive opposites. Marble has seen a resurgence in popularity in the kitchen. 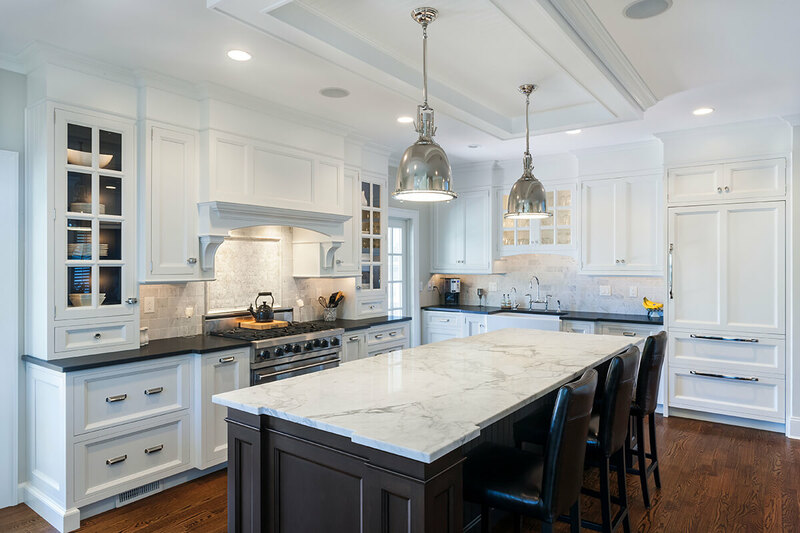 Its bold veining adds drama to backsplashes, islands, and other surfaces, and each slab of natural marble varies in color and pattern, However, that beauty comes at a price. Therefore, dedicating a sizable chunk of work surface to another material, such as wood or laminate, can save you a bundle and still retain that classic look. Cool monochrome. If you want to play it calm and collected with a sophisticated black and white palette, consider upping the ante with a standout island. Choose wraparound black countertops to bring focus to this central feature, and white surfaces for the rest of the space so that it feels light and bright. Compare and contrast. 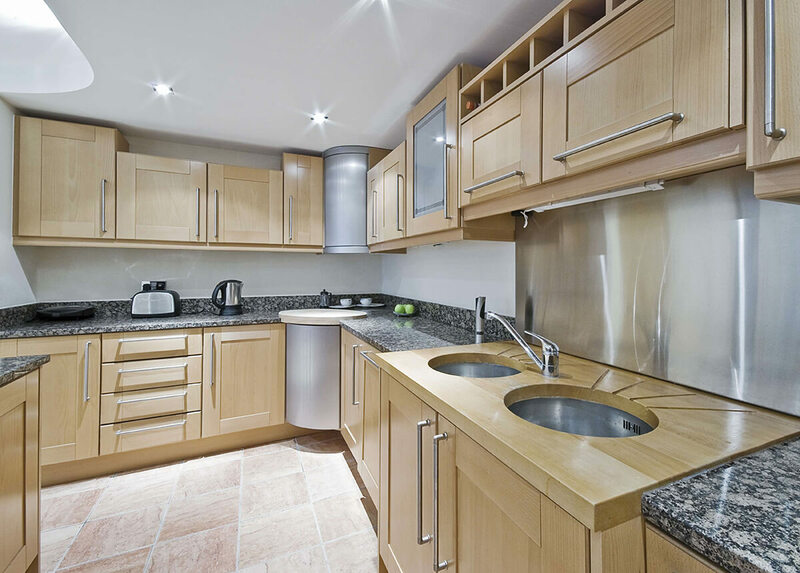 Galley kitchens can often feel a little featureless, thanks to their long and narrow layout. Try raising the pulse by mixing some rough with the smooth. A chunky, tough concrete countertop opposite a skinny porcelain surface will create a stunning contrast that’s sure to get your heart racing. As you can see mixing materials for kitchen countertops has many benefits. 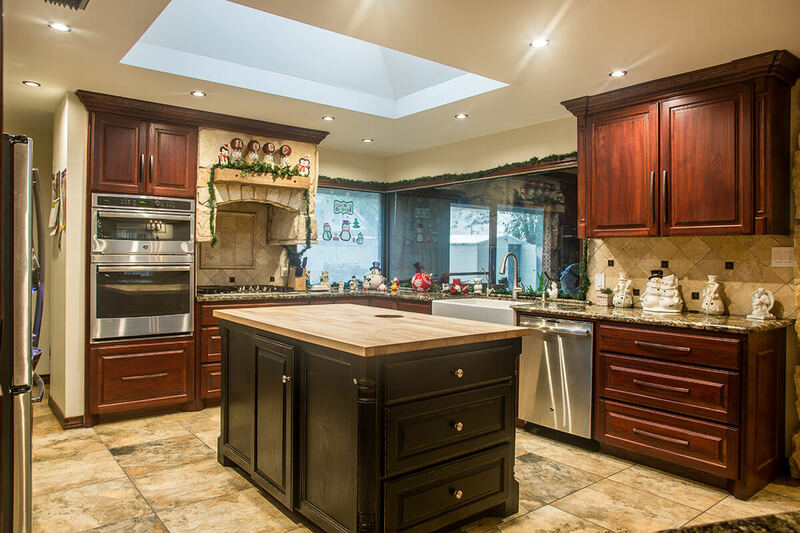 You can save money by using a less expensive material for your perimeter countertops while splurging on something more luxurious for an island top. Plus, mixing materials is a great way to add visual interest to your kitchen and avoid the overabundance of one color or material.